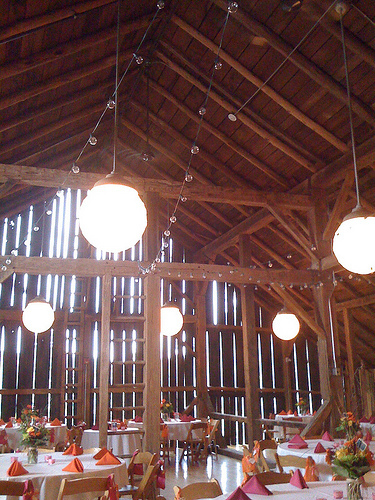 Choosing your wedding reception decorations is an expense that you probably have not thought about until now. When you start your wedding planning you think about the dress and the flowers and where you are going to have your ceremony and your wedding reception, but the details often get overlooked. 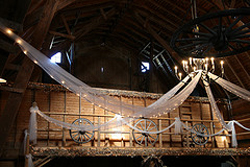 Your reception decorations bring together the theme of your wedding day and your reception venue. If you have lots of money to spend you can turn anywhere into a palace, but with a limited budget you have to be clever with where you spend your money. Here are my favorites and you really can't beat them for amazing colors and the best prices. So much to choose from! Good luck not spending a fortune!! Start off by looking at the room with just the tables in place. You can ask your venue if you can come and view the room when they are setting up for another similiar function or wedding. Be really objective when you look at the room and think about areas that you may want to hide. Think about the table layout, does it work for you? And does it show off the room to its best? Talk with your contact at the venue if you think you would like to change their normal layout, they will be able to point out fire exits and service entrances that they have to keep clear. Moving the tables to show off the room to its best is a great way to save on your wedding reception decorations. You could have a banquet style layout where everyone faces into the room, the tables could be in the shapes of a big U and you could have the dancefloor in the middle. You could have a cabaret style reception where every round table and everyone is facing the same way. This is great if there is a particular wall that you want to hide, you face everyone away from it! Walls can be hidden with rolls of tulle, but this is an added expense - not everyone has rolls of tulle at home! Christmas lights work just as well and most people have lights that you can borrow if you don't have enough. If the room is in need of a paint then this is something that you need to mention before you pay your deposit and book. I have known some couples that have stipulated that a particular wall is repainted before their wedding reception before they will pay a deposit. 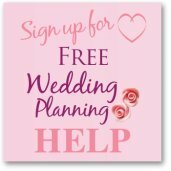 If that is out of the question then you could ask the venue if they could pass on your contact details to the weddings that they have booked before and after you. You could ask if they could share the costs of the wedding reception decorations as it will benefit everyone and make sure that the venue is happy to have them up for the time between each wedding. This will mean that the decorations will need to be kept fairly plain to fit with everyone's theme. I have known brides that have shared flowers at the church and also shared for the rental of tables and chairs. The rental company was happy to keep the items at the venue during the week between the two weddings as it saved them time moving the items around. There are rental companies for more than just chairs and crockery, you can rent your wedding reception decorations! Seriously look up rental companies in your area and you will be amazed at what you can rent for the day of your wedding. If you fancy a Roman theme you could have a Roman pillar for around $15, you can also have 8' drape kits with all of the poles needed for around $30. They may be extra expenses but if you have managed to find the bargain of the century with your wedding venue then adding a few rented items might be just what you need to turn your venue into a palace! 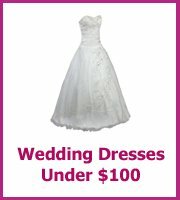 See, you don't need unlimited cash for a gorgeous wedding! When you have your reception room just the way you want it you can add extra color with your centerpieces. 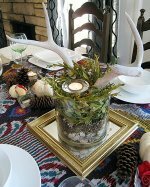 Here are lots of ideas for your cheap wedding centerpiece, plus more ideas to make your own wedding decorations.